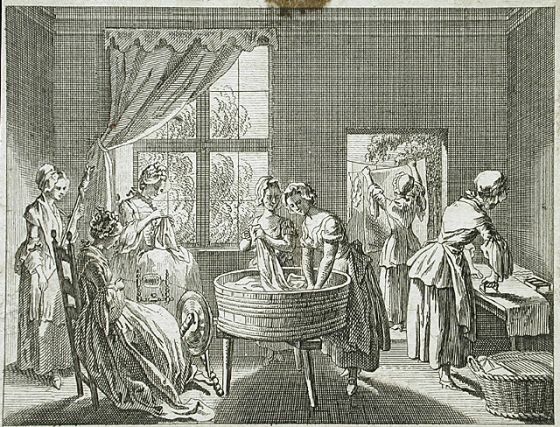 My goal is to regularly update this page with processes that were used to clean linen in the 18th century. To make Linen that is turned yellow very white. Heat Milk over the Fire, and add to a Gallon a Pound of Cake Soap scraped in, that it may dissolve ; and when the Cloaths have boiled therein, take them out, and clap them into a Lather of hot Water, and wash them out speedily. The House-keeper’s Pocket-book, and Compleat Family Cook, Containing Above Twelve Hundred Curious and Uncommon Receipts in Cookery, Pastry, Preserving, Pickling, Candying, Collaring, etc., with Plain and Easy Instructions for Preparing and Dressing Every Thing Suitable for an Elegant Entertainment, from Two Dishes to Five Or Ten, etc., and Directions for Ranging Them in Their Proper Order. 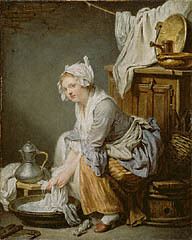 LAUNDRY-MAID. To what we have already said, under the head of clear-starching we shall add some remarks not less useful to this particular servant, than to families in general. A copper for the purpose of washing is what every family ought to have, on a principle of economy, as it will save almost two thirds of the coals otherwise consumed ; for if the stove draws well, (which it may be made to do) it will burn cinders, and almost every kind of refuse, and when the water is once made to boil, a small fire will make it continue. Care should however be taken to keep the copper sufficiently full of water, lest the fire should rise on the sides and scorch the linen. Clear water, and plenty of it, is indispensably necessary, particularly for seconding and rinsing cloaths ; but as rain and river water is often thick or cloudy, care should be taken to have it properly settled, by putting it into vessels a day or two previous to your washing. The Laundry-maid ought to be very correct in counting, and setting down the various articles she receives, and to return whatever has been delivered to her. It will be unnecessary to caution an honest servant against being wasteful of soap, tearing the, linen, washing. or drying it upon hedges and fruit trees; or stirring the linen in the copper with sticks that are splintered or have nails in them or to suffer it to mildew by laying too long undried or unironed; the necessity of these things is too. obvious to need remark ; but there are some other observations worth attending to. To take out Iron moulds before washing is a part of her business that demands attention, and the best method of doing it is, to hold the iron mould over the fume of boiling water for some time, then pour on the spot a little juice of sorrel and a little salt, and when the cloth has thoroughly imbibed the juice, wash it in lee. To take out stains of Oil. Take Windsor soap shaved thin, put it into a bottle half full of lee, throw in the size of a nut of sal ammoniac, a little cabbage juice, two yolks of new laid eggs, and ox- gall at discretion, and lastly, an ounce of powdered tartar: then cork the bottle, and expose ir to the heat of the noon day sun four days, at the expiration of which time it becomes fit for use. Pour this liquor on the stains, and rub it well on both sides of the cloth ; then wash the stains quickly in clear water, with Castile soap, and when the cloth is dry, they will no longer appear. When linen is stained by claret or other red wine soak the stained part in hot milk three or four times a day for several days. Or a little salt rubbed on the part immediately, will prevent the stain from becoming injurious, and it may afterwards be washed in hot milk. Spots of Ink will absolutely ruin the finest linen : — • Lemon juice, and the essential salt of lemon, will by no means answer the purpose of taking them out : the spots will indeed disappear, but the malignity of the ink still remains to corrode the linen and finally produce a hole : it has been recommended in this cafe to lay the stained part of the linen in fresh chamber-lye, for three or four days together, rubbing the stained part every time you change the lye. But the most effectual way is to take a mould candle, or some very pure tallow, melt it, and dip the spotted part of the linen in the melted tallow, then put it to the wash, when it will come perfectly white, nor will there ever be any hole in, the spotted part. This is, given from experience. When linen has been scorched, boil two ounces of fuller’s earth, and the fame quantity of Castile soap, in half a pint of white wine vinegar, and a quart of water, with two onions quartered and half an ounce of hen dung, till it begins to grow stickish then set it by to cool, and when it is in a sort of jelly, put in a little starch and white wine, spread it upon the scorch’d part of the linen, and if it be but slightly done, it will soon recover it ; but if the linen is stained, take two ounces of Castile soap, boil it to a jelly in a quart of milk, preventing it from curd ling; spread it on as you do fuller’s earth, and let it lie on all night, and when that is taken off, wet the place with the juice of a lemon and the stains will soon disappear. The best method of getting up Lace, is to few a bit of muslin to each side of it, then wash it among muslins, or by itself, in three lathers ; and if does not look white, put it into warm butter-milk, and let it lie a day, then hang it up to dry ; and if it is not white enough, you must put it into scalding hot butter-milk, and so let lie till it is cold j then wash it out in two or three lathers, according as you fee occasion : but the lathers must not be blue; then rinse it in pump water; after which pin it upon your board by the muslin very even ; then take muslin the length of the lace, and dip it in water (larch, and so lay it upon the lace till it is dry ; observe not to squeeze any of the starch out of the muslin. When the lace is dry, pick out the purls and the foot very tenderly. If you open the purls, you must make a round hardish pillow, and lay paper on it, which will shew the purls the plainer ; afterwards lay your lace upon the paper, and with a long slender needle, and very clean hands, you may easily open them, if they are well picked out at first ; after you have opened them, lay them upon the board, with a muslin over them, and iron them with an iron not too hot. * To do lace as it is done in Holland, you must pick it off your linen, then take a clean piece of glass, and few a thick piece of muslin over it (but let the glass be square) then roll the lace very even upon the glass, and between every roll soap it ; when it is all soaped and rolled up, cover it with another piece of thick muslin, and let it lie in hot water till the water is cold, which will soak out the dirt ; then put it in a large saucepan of water, and boil it, which repeat; but in your last boil you must put in soap enough to make a lather ; when you have done boiling it, lay it in a dry cloth to soak out the suds i when you perceive the suds to be out of it, and it appears somewhat dry on the outside, rinse it in two clear pump waters with a little blue in them, and lay it in a dry cloth as before, to soak out the water till it is almost dry ; then lay it in starch water a very little while, and wipe the starch off on the out side, and squeeze it not too hard to make the starch come through to the glass ; then dry it quickly, because if it is too long a drying, it will make it look yellow : let it be a little damp when you take it off the glass, or it will stick one roll to another, and be apt to tear; then lay it on a clean dry cloth, and pull out the purls where you fee occasion ; if your lace be new the purls will open ; next few it upon the muslin, and rub it open with a warm iron, that it may not look tumbled ; your lace will look white as snow, and as like new as possible. Some have done them on a board, but that makes them look yellow, and is apt to iron mould them. This is a very excellent way to do any fringes ; but they must not be starched.